I wish I had read this book in a paper copy rather than on my Kindle. Had I done so, the book would be marked up with highlighted sections, and many of its pages would be folded — but at least I could go back without tap-tap-tapping, page by page, to find the parts I want to see again. Yes, it’s that interesting. You may have read about some of the great anecdotes in “Hit Makers:” Why seven particular artists are regarded as the finest Impressionists painters, why “Rock Around the Clock” was the pop music phenom of 1955 and many others. But what is most interesting is the analysis of why certain pieces of music and art and even advances in science succeed while other, possibly better ones, do not. One concept is “optimal newness,” the idea that people like new things but only if those things include older, familiar elements. In everything from pop music to scientific inquiry, people have a much easier time absorbing incremental change than revolutionary change. Thompson refers also to Raymond Loewy, the 20th century designer who came up with successful new looks for cigarette packages, Sears refrigerators and Air Force One, among many others. Loewy coined the expression MAYA, “most advanced and yet achievable.” He understood that people could accept only a limited amount of change, and this understanding led to his remarkable success. There are many ideas in this book, too many to cover here, but I want to mention another concept that interested me. Author Thompson notes that the few old news funnels — radio and then television networks and major publications — have given way in the digital age to thousands if not millions of information outlets. Except “going viral” is not what happens. Among the millions of information outlets are some with extraordinary reach. Many of these outlets have celebrities’ names on them. 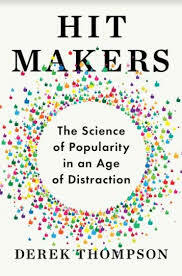 Now I will bring up a discussion inspired by “Hit Makers” but not from the book itself. Several summers ago, we read that the ALS Ice Bucket Challenge “went viral” and raised more than $200 million for disease research. The idea originated with a pro golfer who challenged a cousin to pour ice over her head and donate money to the ALS charity. But the result had nothing to do with viral spread. By contrast, the golfer who dreamed up the challenge has 236 Twitter followers. His idea was smart, but its huge success relied on prominent people who broadcast it through their great big megaphones. Derek Thompson, who graduated from college in 2012, has done a remarkable job with this book. He draws from philosophy, psychology, science, history, business, popular culture and media trends to make thoughtful observations about little-discussed but interesting themes. The book has a nice balance of interesting stories and explanations; it is sprawling in scope, but always readable. I look forward to reading more of this guy’s work.